Welcome to Fairway Hall, is a one-of-a-kind luxurious 14 themed bedroom suites, 14 bathrooms and 6 half bathrooms. Boasting over 12,442 sq. ft., heated and cooled and 17,000 Sq. Ft., under roof, this home is modeled after the antebellum mansion in Natchez, Mississippi and includes furnishings and amenities you have to see to believe. Explore the 14 bedroom suites each decorated with period antiques from one of 14 different iconic American cities famous for their distinct eras of classic American style. Eat dinner at a 22′ solid mahogany table from St Paul’s Cathedral in London, relax on a 19th century antique Regency sofa, get ready for the day at a vanity that used to belong to Marla Maples, and more. There is a 65-inch 4K Frame SMART TV located in the kitchen area so you can enjoy upgraded cable TV. This frame TV also transforms into a beautiful work of art when you are not watching TV. This three-story home offers breathtaking views of the 7th hole of the Nicklaus Course and a conservation area. Watch the Disney fireworks and take in 360-degree views from the home’s roof-top deck! Fairway Hall will take your breath away as soon as you arrive. The signature estate home has 9 king suites and 5 suites with two full beds. Each bedroom has its own theme and a smart 4K TV equipped with Netflix and apps. The two first-floor king bedrooms are wheelchair friendly. 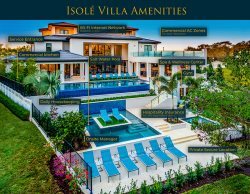 Spend time outdoors enjoying the 55′ saltwater private pool with beach entry, a sun shelf with in-pool canopy bed, eight-person spillover spa, covered toddler’s water jet play area, 1,700-square-foot lanai, 60-inch SMART TV with upgraded cable, and summer kitchen with a fireplace. Upon entering the home, you’ll be welcomed with a grand living area with 24′ ceilings, floor-length windows, marble floors and a stately, 19th-century marble fireplace. A full 40 tons of marble and granite were imported for this superbly furnished home. Discover a variety of amenities sure to keep your friends and family entertained like a game & arcade room with a multi-game arcade machine, 75″ LED TV with surround sound, fireplace, Xbox One with Kinect, 100-year-old Brunswick pool table, and wet bar; a third floor back patio balcony; and an HD home theater with tiered cinema-style seating and a 16’ wide projector screen. There is also a second games room, The Kids Club, located on the ground floor. The Kids Club features two 110-inch 4K SMART video wall connected to a PlayStation 4, Xbox 360, Apple TV, and Cable. There is ample seating for 13. In addition, the home has high-speed Wi-Fi, a dining area with an antique British Colonial fireplace, a fully equipped gourmet kitchen, three laundry areas, and four additional balconies. Discover original furnishings and accents throughout this home including vintage chandeliers and light fixtures, re-purposed wood, wainscoting, antiques, authentic artwork and much more! *Taxes, fees, and applicable security deposit are additional. Based on 13 suites and 34 people maximum occupancy. Please note: This vacation home is provided for the general vacation use only. Vacation rentals may not be used for events or group gatherings that exceed occupancy. Only Guests whose names are on the Rental Agreement are authorized to stay in the home. This property is located at Reunion Resort which is a gated community and association rules that are monitored. We are dedicated to providing peaceful and enjoyable guest experiences. Please refer to our terms and conditions that are in place in an attempt that the property is rented responsibly, for our surrounding guests and the community satisfaction. If you have any questions please contact us for more information. Pool heat available for $60 a day and is recommended from the 31st Oct. to the 31st Mar. If you would like the Spa / Hot Tub to be heated you will need to add pool heat to your reservation.